If part of your pressure washer cleaning job is to keep a site clean as well, one of the first things you need is a water containment system that will work well to meet your needs. The specialized Vacu-Boom system is designed to be used in a multitude of commercial and industrial functions. 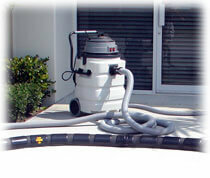 In fact, if a wash water containment system is used in your pressure washing business, Vacu-Boom can help. This wash water containment system is responsible for capturing fluid waste and chemicals for later removal from the work site, which can be really important to lots of businesses. The newly designed Vacu-Boom is a flexible, hollow five inch tube. That tube is then laid flat in order to create a small hill or a dam from the side. Alternately, it can be used in this way to encircle the whole containment or wash area. The open side of the Vacu-Boom should always be down so that you can see the cross section, which is shaped like a “C”. The boom has small holes located on the boom’s water side to let liquids in. When the Vacu-Boom is in use, it is connected to a recovery unit by a twenty-five foot hose. The Vacu-Boom is ideal to use with any water containment systems. The benefits of water containment systems such as the Vacu-Boom is that the boom is applicable on several different hard surfaces including asphalt, concrete, steel and wood. The Vacu-Boom can be set up or taken down in less then five minutes. This is not only a durable piece of equipment, but also fast and efficient. Use the Vacu-Boom in any of your water containment systems applications. Other advantages of using the Vacu-Boom are that this piece of equipment both detains and wheedles out waste water as well as other liquids. Luckily, the materials used to create this amazing water containment system don’t soak up the liquids themselves or the contaminants in the liquids. Another benefit to using the Vacu-Boom is that the boom is easy to move and keep in storage because the boom breaks into sections that are just five feet in length – which means it will fit in any truck or van as well as any storage area. The Vacu-Boom has a very high tolerance when dealing with chemicals such as petro, acids and caustics. These are just some of the many benefits of using the Vacu-Boom with water containment systems. The Vacu-Boom is described as a practical yet innovative wash water containment system that prevents any run off when power washers are at work and when performing washing applications outdoors or indoors. This is an incredibly efficient spill containment system that can handle several kinds of dangerous materials. These types of wash water containment systems, including the closed loop system and the sloped surface containment system can be used when performing outdoor equipment or vehicle washing, in-plant equipment washing, the cleaning of boats and ships to prevent deck run off, emergency storm water containment, cleaning marinas to prevent contamination run off, parking lot or sidewalk washing, aircraft washing and when dealing with emergency hazardous liquid spill containment. The Vacu-Boom is the perfect water containment system in several cleaning applications. Prevent contamination from run off or clean up hazardous material spills quickly, in a matter of minutes. This is the ideal water containment system that can handle many different job applications. Do not think twice when purchasing the Vacu-Boom. This is an excellent piece of equipment that can be used many different ways.